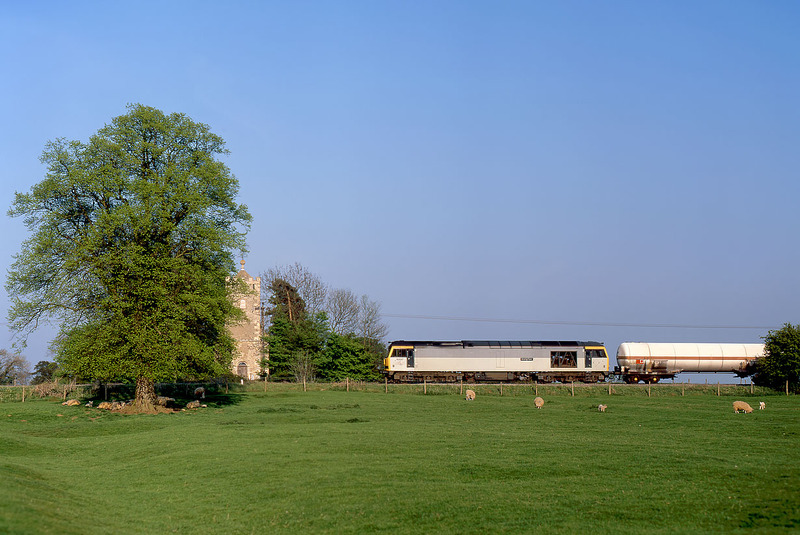 The isolated church of St. Giles at Hampton Gay (between Oxford and Banbury) stands next to the railway line, with a derelict manor house nearby. Otherwise the area is quite deserted, as no trace of the village survives, and as there is no road access a walk across the fields is required to get to the location. This was the site of a terrible railway accident on Christmas Eve 1874, when a crowded express derailed and ended up in the nearby Oxford Canal. 60017 Arenig Fawr passes the site with the 6M23 14:12 Fawley to Longport LPG tanks on 4 May 1995.